Presumably, NBC realized last night’s episode was the best of the season so far. Why else would the opening credits be shortened if not to leave a little extra room for all of the great story lines, each of which, had they been divvied up among other episodes, would have bumped those grades up a notch? But when Michael quoted a stat about China’s population, Oscar jumped in to correct it. It’s hardly surprising that Oscar is the most erudite employee but, in a nice elaboration of his personality, he’s also an insufferable know-it-all with the nickname “Actually.” Jim: “He really does fit that old stereotype of the smug gay Mexican.” But the staff rejoiced because this time it was Oscar who was mistaken: Michael got his facts from “the New York Times dot com.” The rivalry thus established, everybody became absorbed in their competition, one that could very plausibly occupy co-workers for half of a day. Oscar challenged Michael to coffee (i.e., a rematch) and this was our favorite of Michael’s sentiments: “To be safe, I should learn everything about everything but I don’t have time.” As anyone who has gotten lost on Wikipedia clicking from one link to the next until they are reading about the Dreyfus affair when they were only casually researching Paris can attest: so true. Andy, Jim, and Ryan prepped him, game-show-style, but his hopes of becoming a dilettante were dashed when he couldn’t keep up with Oscar’s skinny on information sectors. Not one to be defeated, Michael hijacked the debate with some platitudes about the importance of coming together to talk, mawkish words that, though lacking intellectual prowess, win over a crowd. Meanwhile, Darryl was fed up with Andy’s communication compulsion: “You gotta change the standard for what’s worthy of a text. Ask yourself, ‘Is this something Darryl needs to know?’” Amen to another resonant, if minor, subplot, which actually resolved itself in the credit sequence when we learned, as we hoped we would, what Darryl considered a worthwhile message: “Come to parking lot. Crazy pigeon action.” No, not that kind of action: It’s two pigeons getting so crazy up in a dropped ice-cream cone that their heads are covered with the stuff. On the surface, it looked like our Pam was just trying to remedy the situation by once again outsmarting Dwight. Suddenly, though, a lot more was at stake. In the hallway, she confided to Jim that she felt compelled to be a successful office administrator because she failed at her other pursuits (art school, paper sales). Husbandly Jim assured her this wasn’t the case. Pam: “Well, I’m not an artist and I’m not a salesman, so what would you call it?” That extra beat brought the darkness. Pam, whom we’d practically written off as a Boring Married, reverted back to the character that made her more interesting in the first place. The American series has gotten so far away from the underlying misery that was essential to the British version that we almost forgot Jim and Pam are thwarted professionals. They’re not necessarily unhappy, but they haven’t realized their dreams, either. It was a fitting dose of drama in an otherwise nonstop funny episode. 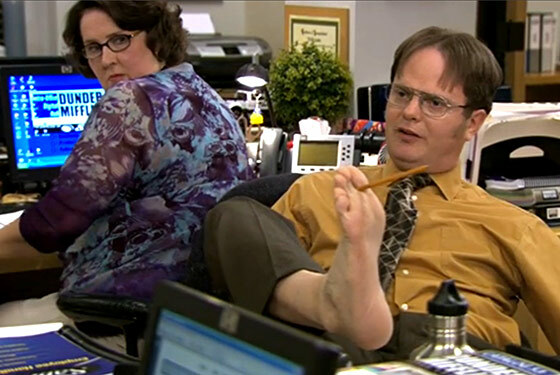 And the twist: Dwight let Pam win owing to a building-code violation that he (via Nate) pointed out. He claimed he wasn’t motivated by compassion. Nonetheless, he struck a sentimental chord.